Miglena Manandhar is a post-doctoral fellow at the J. Craig Venter Institute in the Infectious Disease group. Her interests are in the characterization of virus-host interactions during influenza viral infection. Her research involves developing antibody-based therapeutics to modulate the host immune response and neutralize virus infection. The goal of this study is to develop novel therapeutics to mitigate disease caused by both the immune system and viral infection. 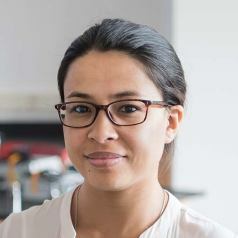 Dr. Manandhar received her Ph.D. in Microbiology from the University of Illinois at Urbana-Champaign in 2017 where she worked on the characterization of the biochemical pathway of biotin synthesis in Bacillus subtilis. She completed her undergraduate degree in Microbiology from Idaho State University. A Canonical Biotin Synthesis Enzyme, 8-Amino-7-Oxononanoate Synthase (BioF), Utilizes Different Acyl Chain Donors in Bacillus subtilis and Escherichia coli. The pimeloyl-CoA synthetase BioW defines a new fold for adenylate-forming enzymes. Nature chemical biology. 2017-06-01; 13.6: 668-674. Pimelic acid, the first precursor of the Bacillus subtilis biotin synthesis pathway, exists as the free acid and is assembled by fatty acid synthesis. Molecular microbiology. 2017-05-01; 104.4: 595-607. A Francisella virulence factor catalyses an essential reaction of biotin synthesis. Molecular microbiology. 2014-01-01; 91.2: 300-14. Proofreading of noncognate acyl adenylates by an acyl-coenzyme a ligase. Chemistry & biology. 2013-12-19; 20.12: 1441-6.